Fed up of the endless treadmill of weight-loss and weight gain, and wishing you could live a life that doesn't revolve around planning your next meal (or feeling guilty about the last one)? Then Beyond Chocolate could be for you. Learn the principles that will help you lose weight for good, without pain, and more importantly, that will help you dump those diet fads for good. Easy to get to grips with, generous helpings of empathy and understanding, and mercifully lacking in any patronising self-help gobbledegook, it explores the alternative to a life of being a yo-yo dieter, aiming to help women break the cycle that leaves most of us left with little self-esteem. Authors Sophie and Audrey Boss are two sisters and both women have written this book from a culmination of personal and wider experience (Sophie is also a trained psychotherapist). They have spent many of their years battling with weight gain, weight loss, purging, guilt and a life that revolved around food; questioning themselves, as most of us have done, about what they should or shouldn’t be eating, and whether or not they should or shouldn’t have been eating it. Sound familiar? Thankfully Audrey and Sophie got utterly fed up of living constantly under the control of food and looked for ways of ending the cycle, which they share with the rest of us in Beyond Chocolate. Through experimentation and letting go of old habits they developed a way of life that’s free of planning around food and much more focused on giving your body what it needs, and about tuning in and eating intuitively. Some of the principles seem revolutionary, but when you consider them carefully, they just make simple sense. It’s only because those of us who have found ourselves on the weight-loss treadmill have become so trained to think that we need to obsess about every morsel that goes into our mouths, in terms of how it will affect our weight, that we’ve stopped doing what comes naturally. It’s time to take stock – do you really want to be unhealthily fixated with food for the rest of your life? If the answer is no, then Beyond Chocolate might be able to offer you something else. 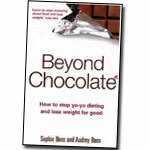 Beyond Chocolate (Piatkus): Sophie Boss and Audrey Boss, 192 pages, paperback. It's a brilliant book and I have started going to their weekly drop-in sessions on a Thursday evening which I am finding very helpful!